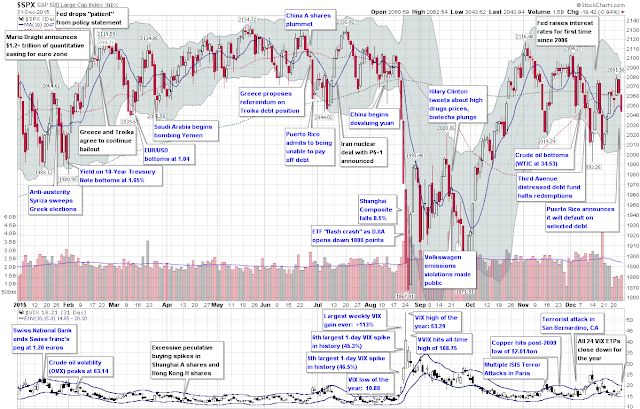 Every year one of my most-read posts is my annotated overview of the year in VIX and volatility. Now that I have been doing this for the past eight years, the aggregated view of volatility from 2008 to the present makes for a fascinating concise history not just of volatility, but more broadly of the financial markets and of economic activity in general. The graphic below captures most of the highlights from 2015 and from a volatility perspective, it was a year for the record books. During August we saw the largest one-week VIX spike (+113%) that resulted from unprecedented back-to-back days of VIX spikes of more than 45%! The cumulative jump in the VIX pushed the VIX to a high of 53.29 – the only time outside of the 2008-09 financial crisis since the launch of the VIX in 1993 that the VIX has topped 50. While most investors pointed to China as the proximate cause of the record VIX spike(s), a VIX and More fear poll one week after the big VIX spike also highlighted “market structural integrity (HFT, flash crash, exchange issues, etc. )” as almost on par with China concerns, with “market technical factors (breach of support, end of trend, etc. )” not that far behind. The balance of the year saw a wide variety of events that moved the markets, including the Fed’s first rate hike in nine years; crude oil plummeting to $34/bbl. ; shock waves in the high-yield bond market due to low oil prices; chilling terrorist attacks in Paris and in California; Puerto Rico announcing it will default on some of its debt; turmoil in the currency markets when the Swiss National Bank ended the peg of the Swiss franc to the euro; a dramatic boom-bust cycle in Chinese A-shares – and a flurry of ineffective interventions on the part of the Chinese government to restore stability; a proxy war between Saudi Arabia and Iran in Yemen; and the European Central Bank committing to $1.2 trillion of quantitative easing. As noted previously, even with all of the volatility, Every Single VIX ETP (Long and Short) Lost Money in 2015. 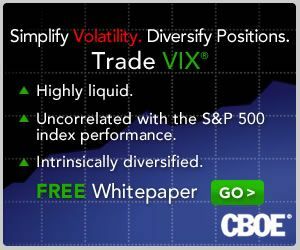 Finally, since 2011, I have been maintaining a proprietary Macro Risk Index that measures volatility and risk across a broad range of asset classes, including U.S. equities, foreign equities, commodities, currencies and bonds. In 2015, the Macro Risk Index was consistently higher than it has been during any year since the 2011 inception. What does high volatility in 2015 mean for 2016? During the past two weeks, Barron’s published two opposing (but not necessarily inconsistent) perspectives on volatility in 2016. For the case for rising volatility and what to do about it, try Jared Woodard’s Prepare for Rising Volatility in 2016. I provide the contrarian point of view in The Case Against High Stock-Market Volatility in 2016.